Elliott has been a competitive athlete his entire life. He played football and wrestled throughout high school, held the position of defensive tackle in college at the Division One level, and competed as a power lifter on his Marine Corps team. During his power lifting career, Elliott was squatting 900 pounds, dead lifting 800 pounds, and bench pressing 575 pounds. 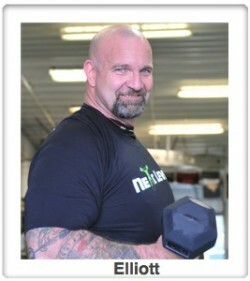 During his fifteen years of power lifting competition, Elliott earned multiple titles, including: All Marine Corps Champion, Junior National Champion, and two National Champion titles. In the end, it was his shoulder that really took “the pounding!” He had undergone two shoulder arthroscopies to repair his rotator cuff and debridements for impingement and degenerative joint surfaces. Over the years, Elliott’s shoulder dysfunction and pain continued to get worse. All activities in his life that involved overhead activities were affected and the pain was getting severe. He recalls that he was unable to throw a football for six years leading up to his decision to have a total shoulder replacement. Following his surgery to replace his entire right shoulder joint, Elliott was instructed to begin physical therapy. He had previous experience with Blaser Physical Therapy years prior for a knee problem. Due to his positive experience, the strong reputation of the clinic, and other patient recommendations he chose to return to Blaser for his shoulder rehabilitation. When Elliot started physical therapy he was experiencing significant pain and swelling throughout his entire arm. His physical therapist immediately recognized the unusual nature of his swelling and took measures to reduce these symptoms to avoid complications. He continued to progress with a strengthening program. He eventually returned to work but his demanding schedule made it difficult for him to continue his physical therapy. His physical therapist worked closely with him to outline an appropriate program he could continue safely on his own. Now, both the simple activities and the more difficult ones are able to be performed pain free when they had not been tolerable for years. He is dressing, shaving, reaching overhead and even throwing a football again! Elliott is proud and excited about his success. What I really appreciated about Blaser Physical Therapy was their responsiveness. My physical therapist was proactive to get in touch with my doctor to get what I needed. I don’t think if I had gone to just any clinic I would have gotten that same kind of attention.